The Society was contacted by a descendant of Clement Bertram Burt who ran The Stores, Orchard House in Leigh from about 1923 to about 1935. She sent us a receipt dated July 1935 made out to Mrs C H Burt (Mrs Cyril Hyland Burt – nee Olive M Martin) – Clement Burt’s daughter-in-law. They were married at Brentford, Middlesex in the early summer of 1935. 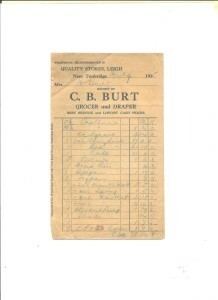 Olive Burt had undertaken a ‘big’ shop for their new house and Clement recorded the purchases from his shop in his ledger. He subsequently offered to pay for the items as a wedding present. Cretanne is an unglazed cotton cloth printed with coloured patterns – probably in this case used for curtaining. The receipt highlights what a young couple would be purchasing for their new home – and how much things would have cost – in 1935. After receiving the letter and receipt, I decided to do a little research on Clement Burt. Other records also help us locate Clement Burt. In both the 1911 and 1918 Kelly’s Directories, C B Burt is listed under Drapers at Chiddingly, Halland. The British Phone Directories between 1923 and 1934 give him as living at The Stores, Orchard House, Leigh. There is a photograph of the stores at Orchard House in Chris Rowley’s book “We Had Everything …” (p. 24) which gives a date of of ‘about 1925’ with the store being shown as “Lindridges” – the name of the previous shopkeeper. 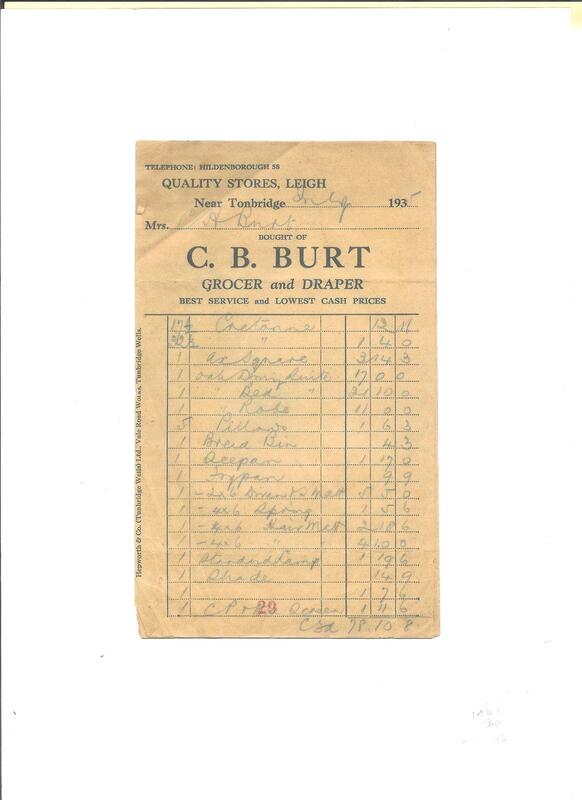 But in 1925 Clement Burt was already there, so either the date of the photograph is wrong or Clement Burt retained the Lindridge name for the store. I have taken the liberty of captioning the photo as ‘early 1920s’. 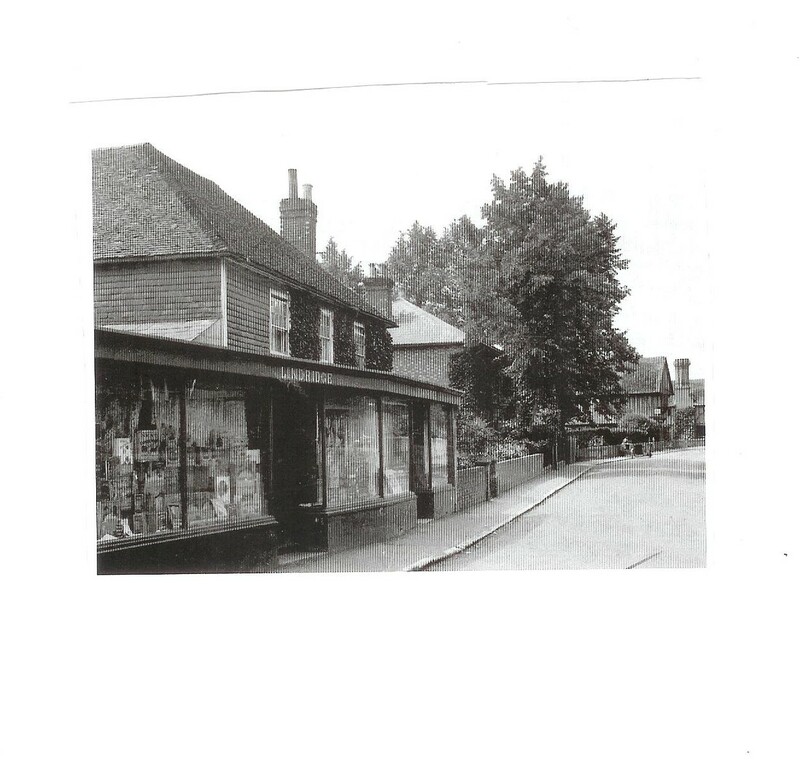 Some memories of Clement Burt are given in Chris Rowley’s book “We Had Everything …” Harry and Jack Lucas said “Where the Clock Shop and the Hairdresser are now in Orchard House, there was a big grocer, run by Mr Burt who wore a black bowler hat. It was the top class one – where the gentry went. The children used to do odd jobs there too. Things had to be weighed out. The sugar used to be delivered in hundred weight sacks and we weighed out two pounds and put it in those blue paper bags. And the vinegar would come in big wooden barrels and the lads would roll them in. And we’d deliver the groceries on the big delivery bikes, and get sixpence each on Saturday morning – I remember riding out to Killicks Bank. Mr Burt had a man called Mr Eldridge working for him who smoked cigarettes. In the summer, he used a magnifying glass to light them – not matches. We all used to think it interesting as children”. In 1935 Clement and his wife left Leigh and retired to Hove in Sussex. The Kent & Sussex Courier for 26 July 1935 details a presentation made to him at Leigh Church. “After the morning service on Sunday the choir of St Mary’s Church presented Mr C B Burt with a fountain pen and propelling pencil. In making the presentation the Rev. F. L. Sealey thanked Mr Burt warmly for his regular help during the thirteen years he had been in Leigh. They had enjoyed his fellowship and on behalf of everyone he wished him and Mrs Burt every happiness in the coming years during their retirement from business”. Clement and his wife retired to Hove – the British Phone Directories from 1938-1942 show him as living at “Lyghe”, 193 Nevill Road, Hove. He and Ethel must have retained some affectionate and happy memories of his time in Leigh to have named his home after the village. Mrs C B Burt is listed at this address in 1948, for her husband had died in 1941 aged 66. The Kent & Sussex Courier of 19 December 1941 reports his death: “The death occurred at Hove on Saturday at the age of 66 of Mr Clement Bertram Burt, who was born at Sandhurst, Kent and spent the whole of his working life in the grocery trade. He had businesses at Chiddingly and later at Leigh until his reitrement six years ago since when he had resided at Hove. He was a prominent member of the Grocers’ Association, and, having a remarkable talent for friendship, won and kept a large circule of acquaintanes. Since his reitrement he had devoted much of his time to voluntary work for the blind at St. Dunstan’s. He was also a staunch member of the Church of England, having been People’s Warden at Chiddingly and in the choir at both Chiddingly and Leigh. The interment took place at West Blatchington churchyard on Wednesday”. Copies of the newspaper articles are in our archives, but are available to view on the FindmyPast website.